Last week, Spirit Airlines became the latest U.S. airline to slash its Q1 unit revenue forecast. Fortunately, the company is still seeing good booking trends for April and beyond. 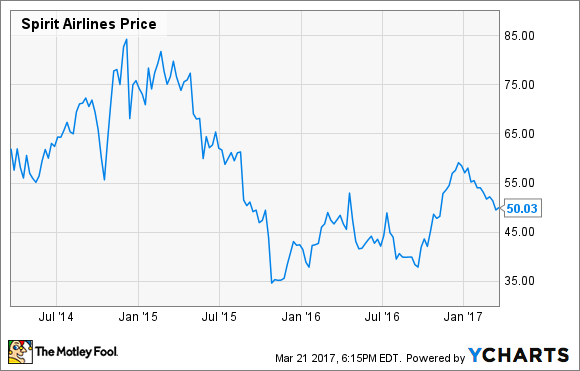 Spirit Airlines (NYSE:SAVE) investors have had a bumpy ride for the past few years. After soaring as high as $85 in late 2014, Spirit Airlines shares plunged about 60% to a low near $34 in late 2015. The volatility has continued in the past year and a half, as investors have tried to weigh Spirit's chances of maintaining its strong profit margin. A lot is riding on Spirit Airlines' new route strategy, which is designed to drive better unit revenue results. Thus, investors have been anxious to see a trend of consistent unit revenue improvements at Spirit Airlines. Instead, the company recently revealed that revenue per available seat mile (RASM) will fall more than expected in Q1. Fortunately, this downturn in unit revenue is probably just a blip. During Spirit's Q4 earnings call back in early February, management estimated that RASM would drop 2.5% during the first quarter. This would have represented a slight improvement over the 3.6% decline logged in the final quarter of 2016. However, U.S. air travel demand has been inconsistent in the first few months of 2017. As a result, a slew of airlines have been forced to reduce their Q1 unit revenue forecasts this month. Spirit Airlines followed suit last week. Spirit Airlines reduced its first-quarter unit revenue guidance last week. Image source: Spirit Airlines. Spirit's reduced RASM guidance makes sense when you compare the carrier's performance to that of JetBlue Airways (NASDAQ:JBLU). While JetBlue serves a more upmarket niche, both airlines primarily operate in the eastern half of the U.S. and in Latin America, with a big focus on flights to and from Florida. Thus, they are impacted by the same broad trends. JetBlue reported a steep decline in unit revenue for the month of January, and it also expects RASM to fall 4%-5% year over year in the first quarter. JetBlue's management expects the timing of Easter to depress RASM by 6% this month, with a corresponding benefit in April. If this estimate is correct, the Easter shift will reduce JetBlue's Q1 unit revenue by a little more than 2 percentage points. By contrast, on Spirit's earnings call last month, Chief Commercial Officer Matt Klein projected that Easter would reduce Q1 RASM by about 1.5 percentage points. In other words, Spirit's explanation that it underestimated the impact of the Easter shift seems quite plausible. Spirit Airlines tempered investors' disappointment by noting in last week's investor update that unit revenue is still on track to return to growth next quarter. Obviously, the Easter shift will go from being a major headwind this quarter to a big tailwind in Q2. However, that's not the only source of improvement. Spirit is also benefiting from some recently implemented changes to its revenue management approach and new non-ticket revenue initiatives. Lastly, for the past two quarters, Spirit's unit revenue has been dragged down by the big batch of new routes it started last fall. New routes almost always take at least a few months to ramp up to peak profitability -- but in the long run, Spirit Airlines expects its new route strategy to deliver superior results relative to its prior approach. In the past year, Spirit has built the foundation for stronger unit revenue growth in the future. These moves are on track to start paying off next quarter. As Spirit Airlines demonstrates that its revenue initiatives are working, the stock is likely to start moving higher again.